Look forward to more Guitar plugins UA! After 20 years of mic'ing up amps I'm using more often UA guitar plugins now. This is a nice, natural sounding mod to track with if you've got an Apollo. Nice feel and air, much like playing a real amp with a mic'd cab. I would definitely recommend for those guitar players who are looking to re-amp but insist on tracking with a natural feel, but you will need to have an Apollo to make this work. And the plugins then... I think they are really versatile. Have been looking into buying these for a long time, but now I'm glad I didn't until know! Just check out the demos and hear for yourself. Responsive, gritty, powerful! Nice amp sims! True to the Firedman Tonal Vision!! Very pumped that these are on the UAD platform. Fortunate to own a BE100 and it is just so organic and musical. I also have a Kemper so I can say for a modeling/profiler environment these are superb. The day I noticed these were released I happen to by tracking my BE100 DI through a Suhr reactive load box and got several A/B for comparisons. Must admit it was very accurate and responsive in most every aspect. The built in delay and mic/cab presets are very cool and allow to quickly color the sound to your desired application. These are very good value and an awesome portal to enjoy Dave Frideman's incredible work. No risk in picking these up. This is a spectacular bundle. The BE-100 nails the brown sound, but it can also dial in some great crunch and classic tones. The Dirty Shirley is my preferred option of the two for clean to crunch. It's very warm and full. Really impressed with the BX guitar amp sims. I also own the Chandler. I hope to demo the ENGL retro soon. A few weeks ago now, I purchased an Apollo Twin Solo. My 1st UA product. Based on that purchase, I was able to get a 14 day demo on other various UAD-2 plug ins. What I REALLY love is that I can do this in MY home, at MY pace and not in some store with some guy wanking on Smoke On The Water. I am SoOo impressed with this plug in, I bought it. HAD to have it. Sounds STELLAR just noodling around thru monitors and/or of course sounds great recording. I have played both "real" versions of the BE and the DS and volume aside, this is a dead on recreation of the sound you would find. You can check it out on YouTube under markthomasmusic. Apollo Twin, Thunderbolt, zero latency that I can detect. FEELS like I'm plugged into the real deal! Brainworx got it bang on with the Friedman Amp collection! 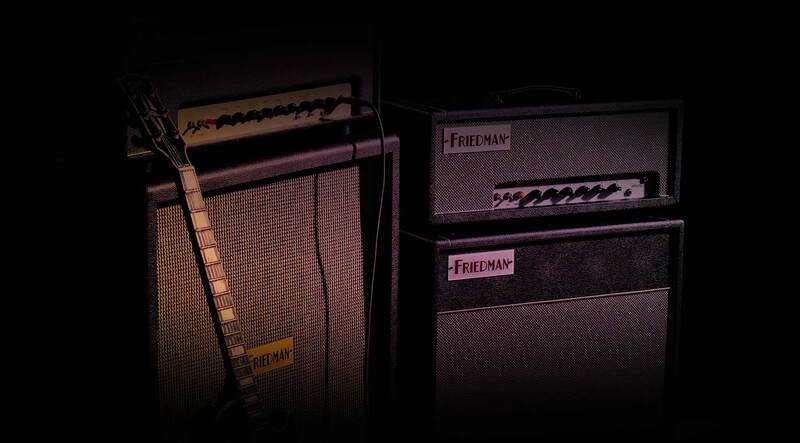 I have been using Friedman amplification for the past few years. They are superb in the studio as well as live. I currently own a BE100 and have been using it in the studio and isolated environments constantly over the course of 2 and a bit years, even when it was hard to get your hands on a modded Dave Friedman amp i had to mustle one up from somewhere as they really are so musical and powerful in the studio! So at the beginning of the year a friend posted a video demo of this Universal Audio / Brainworx plugin of the Friedman BE100 and i was instantly interested in trying it out. All I can say is that they really must have worked hard on the design and development of the plugin with Dave as it is extremely good and spot on! Recommended! WOW! The best Ive used, lots of killer tones here, I particularly love the BE-100, yes a high gain monster but it also a killer clean channel as well. The input gain and the noise gate are handy, so much in here it will keep me busy for ages. Also worth mentioning, you can have 4 settings per preset, so you can have slight variations or completely different tones within the one preset. I upgraded to an Apollo quad from an Eleven rack and they are worlds apart, the Apollo and UA plug ins are the ultimate set up for guitarists! My plug in chain is legendary! It is the best rock amp modeling. Utterly amazing! Both the BE-100 and the DS-40 have something incredible to offer, but will require you to really open your mind and spend some time to find the right cab model and learn how the gain structure and tone controls of these amps affect your sound. It took me weeks (literally) to get this right but now that I have them dialed in they are simply the best Amp plugins I have ever heard. When you power them up, immediately mute the stock preset and start from scratch on creating your own sounds. While these amp have the most to offer I also feel they have some of the worst presets I've ever heard...so grab your favorite guitar, set everything to the middle and start auditioning cabs. Spend some time and you'll see (and hear)! I gave this a test run along with the other UAD amp sims, of all of them this seems the most versatile. It's also good to see that you can turn of the speaker simulation ,I tried this running in to the speaker sims on Ocean Way , sounded great .. Damn that's two I will have to purchase now ! Lo acabo de comprar y estoy bastante contento con el sonido de los dos amplificadores. es verdad que los presets que te vienen no me gustan pero cuando lo toqueteas un rato consigues muy buenos sonidos y la respuesta de los amplificadores es genial. Absolutely amazing!! First Guitar plug in I've used or heard that really sounds like a real amp cranked up. Definitely get the "brown sound" with it. Makes me want to sit and play guitar. I thought that Amp Rig was pretty good until I heard this. It's incredibly dynamic and touch responsive. Just love this plug to death!! I own numerous guitar plugins and rigs being that I'm a guitarist! This AMP is a 5 STAR all the way! My new go to! With tweaking, you can get what you are looking for IMHO! I have heard and recorded the actual Friedman BE-100, incredible amp. This plugin captures the vibe incredibly well! Lots of subtleties. Best amp sim I've ever heard, no doubt. I'm having a blast playing through it! I love the multitude of different cabinet & microphone combinations as well. I can't wait to have my friend over to play through it and get his impression (a phenomenal player and Friedman endorsed artist). I like these a lot, the best hot rodded Marshall type sound I've gotten out of a plugin. Would LOVE to hear an amp sim dedicated to clean Fender sounds (not just the BF Deluxe or BF Twin). I have the Softube amps and both ENGL amps. I usually use the Fender in Amp Room for dirt and the ENGL 646 for clean tones. These Friedmans are great. I am able to get really nice clean and dirt tones from them. It took me a while to get the hang of them, but now that I understand how to gain stage to get what I want; they are really great. I hated guitar simulation plugins before trying this collection. Simply beautiful. Very nice dynamic and beautiful saturation and sustain.